Changeful Times - Irkutsk in Flux! Only few visitors will return to Irkutsk again and again; however, this is especially appealing, since only through this you will notice the more or less subtle changes. In 1995, foreigners from the West were almost exotic in this part of Russia, and they were probably the only ones to notice that the Mercedes S500 that just passed by still had a Munich license plate. Well, its "new" owner could be sure no one from Munich would ever be looking for their lost vehicle in Siberia. And even if so, who should take it back to them to Bavaria? The Russian Mafia hadn't discovered this line of business for themselves anyway. Probably for some good reason. Apart from the invasion of these noble jalopies from Stuttgart, other changes soon took place in the cityscape of Irkutsk. While then at least the sign saying "Fichtelberg" above the entrance of a restaurant would attest to the partnership between the KPDSU in Irkutsk and the SED party leadership of Karl-Marx-Stadt (now Chemnitz again), a few years later, the young Irkutskian high society would swagger around in these rooms to newly clothe themselves. The name and the products offered have drastically changed. 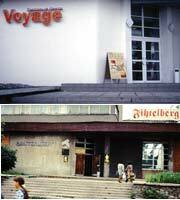 "Fichtelberg" has become "Voyage"; Pelmeni and Schnitzel have become dresses from Armani and Versace. Only the function of the obligatory doorman hasn't changed. Nowadays, they are still supposed to keep away unwanted visitors. Now as ever the social status will decide who may spend his money there. Quite different vehicles came to Irkutsk in a totally legal way. In capital letters, ads on old busses of the Ikarus brand promoted a visit of the WERTkauf Center in Heidenau near Dresden. As in the past, in the GDR, these busses trailed heavy black clouds of dust. Who should bother to remove the nice and colorful advertising messages? 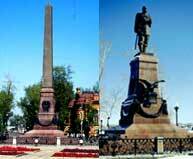 Only much later, the first Russian memorial was ground in Irkutsk. However, no one dared to touch the Lenin memorial, which had been erected in 1950 at the site of the Lutheran church. Rather, people decided to restore the memorial which had been erected in honor of Tsar Alexander III after the opening of the Trans-Siberian Railway in 1908. Just 3 years after the October Revolution, the bronze statue of the Tsar had been dismounted and presumably melted down. The only remains were 4 prominent bronze reliefs on the base, among them the double eagle with the Tsars ukase (edict) for the construction of the Transsib. Not before 1964, the memorial was "completed" again and a concrete obelisk, which was dedicated to the discoverers and conquerors respectively of Siberia, was put atop the base. With the aid of various sponsors, the old Tsar memorial could finally be re-erected in October 2003, and the obelisk was removed from the cityscape. So, while hardly any cars with German license plates (except for a few bold German tourists) have been seen on the streets of Irkutsk for the past years, by now, almost 50 % of all drivers are driving on the allegedly wrong side. The cars are imported via Vladivostok from Japan, and there, as is generally known, left hand traffic is prevailing.